Hairstylists are some of the most bubbly and fun people to be around. But under all the pep and lively personality, there are hidden pains. Majority of their day are spent standing. In a regular basis, this can really take a toll on one’s feet. The most common complaints among hairstylists are sore feet, swelling legs, varicose veins, and tired feet. And those regular working shoes just won’t cut it. Finding the right shoes can make a difference. You will need a footwear that provides you the stamina to stand the entire day with an equal measure of style to look sharp while you’re at it. And that’s what this article is all about. Here we will make an in-depth guide on what to look for in the best shoes for hairstylist as well as the rated and reviewed products that go with it. Because we believe that you can only work at your best if your feet are comfortable which you can only achieve if your footwear permits. First Things First: What is the shape of your feet? 2. 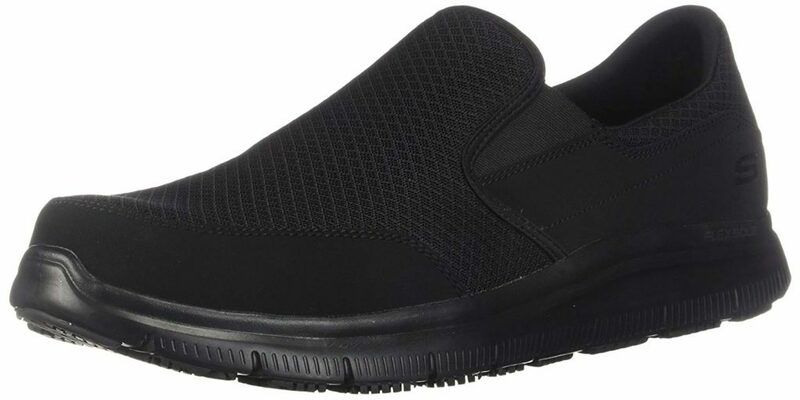 Skechers Work Relaxed Fit: Flex Advantage – Mcallen SR: Work Like You’re On Your Barefeet! It is a common sense that one should know the width and length or so-called the size of the feet before buying shoes. But what about the shape of the feet? It’s often a consideration that many buyers ignore but also matters, unless you want to force your feet to conform to a particular shape of shoes and deal with painful blisters and calluses. Known as the foot arch type, feet also come in different shapes and yours may fall in the following category. 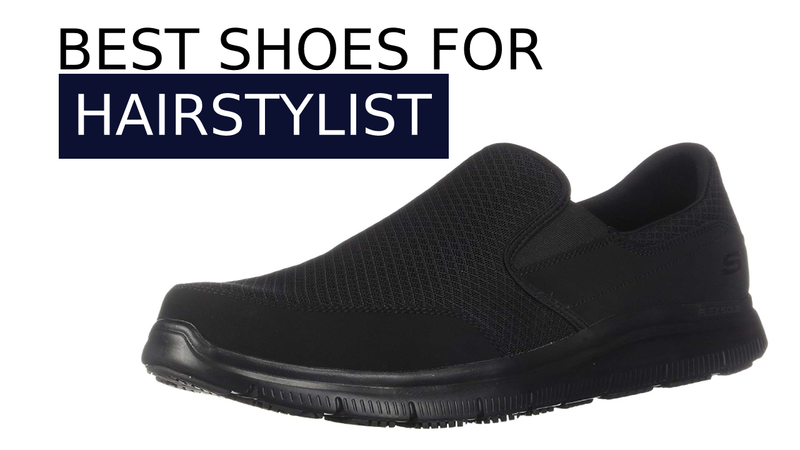 Also, some arch type have a special shoe that needs to be accommodated so we also included some helpful features you should look for in the best shoes for hairstylist. Low-arched or Flat Feet: If the arch of your foot or the ligament that runs along the bottom of your foot sits low to the ground and is very flexible, it is in low-arched definition. Potential Problem: Since flat-feet are more flexible, they tend to roll inwards, contributing to muscle stress and joint problems: Look For: Shoes with a medial rear foot or a straight last and motion can help maintain the proper alignment of your feet, prevent injuries and related muscular pains. Medium or Neutral-arched Feet: Your feet fall into this category if it isn’t flat nor overly-arched but just moderately flexible. Potential Problem: This type of feet is commonly susceptible to heel pain and tensions since it’s hard to find shoes that properly fit with this type. Look for: You can benefit from sturdy midsoles or cushioning, one that is straight to semi-curved lasts for comfort and rear-foot stability. High-arched Feet: This type is characterized by a well-defined arch that sits higher from the ground. Potential Problem: Your feet can have a lesser surface to disperse shock with high arches. This can lead to excessive pressure on both rear foot and forefoot. Look for: A comfortable cushioning or pads can help compensate for the lack of surface area for shock absorption. You may also find shoes with a curved last helpful in giving your high arch the support it needed. Bonus tip: Still unsure about your arch type? A simple wet-test can help you examine how high or low your arches are. First, wet your foot and step on a piece of cardboard. If you can see a noticeable footprint, you likely have low arches. If you can only see the heel and toes of your foot without much in between, chances are, you fall under a high-arched type. On the other hand, you have medium arches if the arch of your footprint is just about half-way filled. Choosing the right shoes to wear in the salon can really be overwhelming. From crocs, jelly shoes, slip-on sneakers down to work boots — where do you start? Well, scratch that. The most important thing to consider, whatever type of shoes you are after , are the functional features and constructions to eliminate that foot pain and keep you gearing. Do you know what your shoes are made of? When talking about the ergonomic design, it all comes down to a comfortable arch and shoe support. A good shoe support can work wonders to lift your arches, provide stability and pain-relief. If your shoes lack of the following features, then you are bound to have those episodes of foot pains. Upper Pad: This feature serves to support the shoe on your foot. The construction is usually of mesh, synthetic material or leather. Midsole pad: This may come as a gel, foam or air midsole which basically functions as a cushion to reduce the impact as your feet lands on the ground, making your muscles to work less. Insole Pad: Your shoes may have built-in or removable sole pads that support the whole feet and arches. This also provides stability and cushioning. Heel Collar: Located on the top of the upper, just around the sides and back of the heel is the heel collar that serves as cushions to the ankles while ensuring a proper fit. Toe Box: The front of the shoe should have a sufficient room for your toes. And it should be deep and roomy. This helps prevent calluses and painful blisters. Outsole Pad: Besides the interior cushions, good shoes to stand by are those that have grooves and treads. These kinds of outsoles, when making a contact with the ground, help keep up with tractions. Achilles Tendon Protector: This feature functions to reduce stress on the notch of the heel collar where the Achilles tendon is by making sure the shoe is locked around the heel. Other Helpful Features: Shoes that have velcro straps gives you the opportunity to adjust the shoe to fit you more while stabilizing straps helps stabilize the foot. The lacing system or the eyelets are also things to consider. You will find lace lock designs and eyelets with variable widths helpful in allowing you to adjust the shoes according to the width and height of your feet. Does your shoes have ventilated mesh panels and air vents that allow airflow? You are already dealing with foot-fatigue here, you certainly don’t want sweaty feet adding up to your discomfort, do you?. And the last thing you want is making your clients uncomfortable with funky foot odor brought about by the perspiration of the feet. This is why it is important to look for shoes constructed with breathable materials. An example of these is a synthetic material, preferably a nylon mesh as well as open foams because they allow ventilation. Open knits and looser weaves also help your feet cool down and prevents foul odor. Ditch those thick and heavy shoes. They are not meant in a working environment as yours where you have to move around a lot. Heavyweight shoes will only contribute to fatigue. The material and cushioning are often the factors that contribute to the weight of the shoes. We are not saying to ditch the cushions as they are an important part of ergonomic features, but at least go for materials that are airy like those that are foam-based. Other lightweight shoe materials include blown rubber, nylon, and polyester. Shoes with a hard flexing point can additionally aggravate arch pain, shin splints, and numb toes. You can check the flexibility of the shoes by slightly bending the shoes through the heel and the tip. It should create a crease along the line just enough to let you have the comfortable and sturdy support. In contrary, ıt should not bend too much as shoes with too much flexibility may not provide structure and support for longer use. What your clients see amid the hair and clippings on the floor is your footwear, might as well go stylish right? After all, you are in the beauty industry and most clients would expect their hairstylist to be fashionable. Also, if your work already limits you of your uniforms choice, wouldn’t it be nice to have shoes that speak to your sense of style and personality? Finding shoes that have the equal measure of style and comfort can be tricky, however. But if you search enough, there are an array of shoes in the market you can choose from according to your style without compromising your level of comfort. They said quality comes at a high price. This also applies in shoes. While some of us don’t mınd spending a hefty sum of money, it’s still good to purchase something that is worth what you paid for, right? That’s why we have rounded the following best shoes for hairstylist to make your investment worth it. Comfy slip-ons, classic leathers, fashionable boots and even heels — you name it. Whatever style you are into, this list has got something for you. 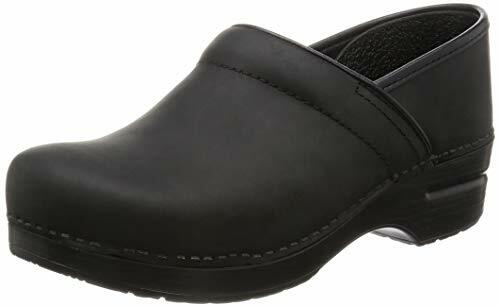 People in the nursing industry rave about slip-on shoes from Dansko, maınly because it gives them the much-needed support for the hours they spent on their feet. We cannot see why you cannot love it too! Among the features that provide comfort and support are the paddings in the instep collar, toe box, and the memory foam. A poly (PU) synthetic leather makes the inner frame and the outsole. The outsole itself is light but highly abrasion and water-resistant plus won’t wear out easily because of the excellent long-term mechanical make-up. The shoe is made of oiled leather which means it has undergone intense nourishing treatment, resulting in a material that is very durable. It’s also available in different leather textures, colors and designs ranging from linen patent, cobalt blue, distressed panelling and much more. When you walk without anything on your feet, the first thing that will land on the ground is the ball of your foot, which creates a lesser impact on your feet ankles and knees, resulting to a lesser fatigue. Perhaps, this is what Skechers has in mind when they designed their slip-on. The panels are of a mesh made out of yoga mat material to perfectly give your feet the cushioned support to handle the impact. It’s reinforced with a memory foam insole stitched with a soft padded collar. All the materials mentioned are known to be extremely lightweight, rest assured you’ll be much more comfortable in a long period of time whether you’re standing or walking. Because it’s constructed with mesh, your feet will how light and airy it is. These shoes are essentially a vacation to your feet, to say the least. A company that started out as an orthopedic brand which aims to manufacture footwear for working professşonals, Alegria is also now home to a range of boots with a plethora of designs, embellishments and textures of leathers to suit your style. Besides the fashionable detailing abounds, their Caiti collection of ankle boots are made of a breathable interior to keep dry and healthy feet. The footbed is designed with latex and cork that feels like a comfy “sofa on your feet” as one user would describe. The ankle area is also padded in the front and back for comfort. And although it has a 1.5-inch heel, the lightweight rocker outsole and bottom flat will still give you natural motion from heel to toe. If you are always on the go, you’ll also love the adjustable hook-and-loop buckle that makes it easier to fit in the shoes. 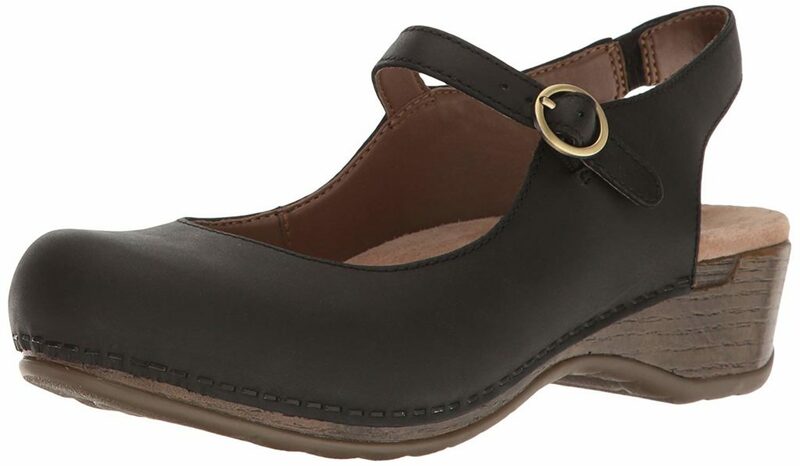 Another of our favorite from Dansko is their sandal shoes. What we love about it are the classic, timeless color selection and leather construction that matchup any uniforms of choice or even casual dress. However, it made it into our list because of its micro-fiber wrapped footbed that provides comfort and stability while you rock on those 1.75-inch heels. The midsole and outlet are made out of lightweight materials. It has a well defined-arch and whipstitched shank for an added support and stability. It’s an open shoe so it’s easier for your feet to cool down. The pull-up sandal is designed with an adjustable buckled instep plus a heel strap to secure your foot in place. You know the feeling when you’ve clumsily stained your favorite pair of shoes with hair chemicals. And no matter how you scrub it, ıt won’t come away. Instead, it only made the stain worse and the material damage. This wouldn’t happen if you are wearing this clogs from the award-winning manufacturer of footwear, Vangelo. It’s geometrically designed to carry fluids and grip, wet surfaces. No wonder it’s also a favorite footwear by chefs (we mean chefs like Guy Mitchell himself!) who always have to battle with stains, hot water, and hard slick surfaces. Inside is an EVA-foam based lining and an ortholite removable inserts that make this shoe durable and comfortable. In addition, it also has antimicrobial properties to keep those sweat-feasting bacteria at bay. Now doesn’t all this sound healthy to your feet? We can’t also help but mention, Vangelo footwears are recommended by the American Podiatric Association (APMA) for “better foot health products” and has passed the US Precision Lab Testing. 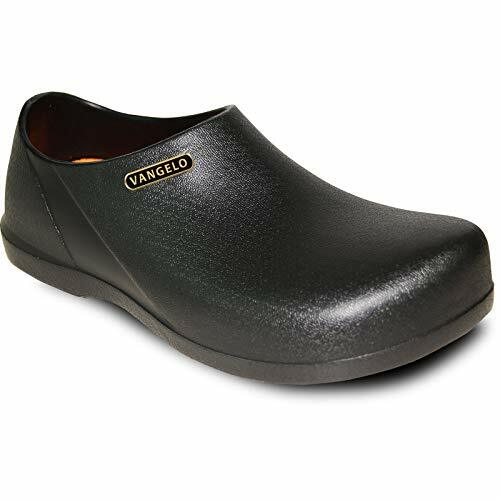 What’s more, all slip resistant clogs manufactured by Vangelo are made in accordance with the standard of American Society Testing Materials (ASTM). When is the last time you wear your heels for a long period of time without feeling the muscle pain or tiredness? We all know that with heels, it’s nearly impossible to stand all day. 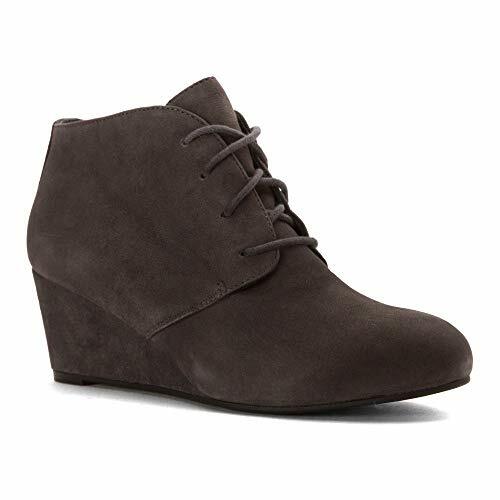 But not with this wedge boots from Vionic. The hounds may be over 2 inches, but it’s wedge-designed which happens to be one of the most comfortable heels with a sturdy support. Also, the footbed is of cushy micro-fibered EVA with spacious round toe so you’ll feel less tired and will still have the energy for after-work soirees. We mean, why not the shoes are made of classic suede, leather textile lining, and stylish lace-ups, creating sophisticated shoes perfect for both work and casual wears. Aerosoles loafers take another classic approach to fashion at work with their luxe faux moccasin loafers. Choose from their snakes or crocodile-inspired designs of different colors. Their arch support features also don’t disappoint. It’s crafted with extra thick foam footbed for comfort while a subtle lift heel completes the design. The sole is made of synthetic material embossed diamond carvings for amazing grip and a forepart that flexes just right to give you natural strides. Aerosoles Slip-on loafers is yet another proof that can be both stylish comfortable at work. 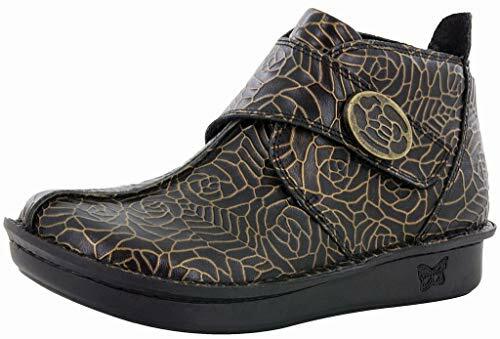 If you are looking for the shoes with best support profile, Dansko Professional Mule got you covered. Out of the bunch, Dansko has the most arch and heel support features to provide you comfort all day and end those nagging foot pains. We also like the fact that the collection doesn’t limit buyers of colors and design. Whether you are into oiled, distressed or metallic leather, there’s bound to be a Dansko Professional Mule that suits your style.